Its model number and name are #055 / Mephisto. 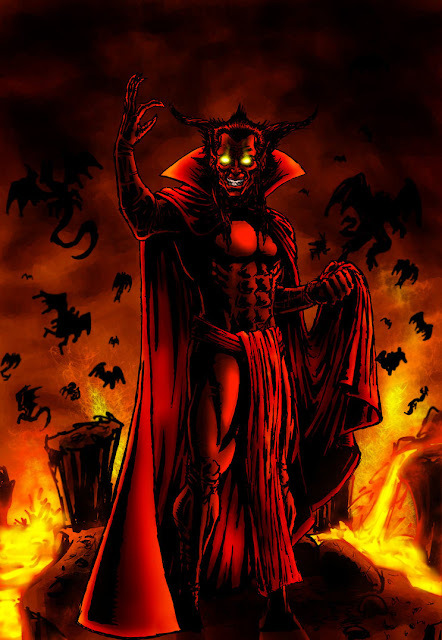 Character Bio - Mephisto is a perennial villain in the Marvel Universe, and is responsible for a number of evil acts, including capturing and holding the soul of Cynthia von Doom – the mother of Doctor Doom — until Doctor Strange and Doom free her to ascend to heaven. He was jealous of the worship of the fire demon Zarathos, so, posing as Satan, Mephisto creates the Ghost Rider by bonding Zarathos to Johnny Blaze. In one story where he battled Thor, he was shown to have various historical villains in his realm, such as Adolf Hitler, Blackbeard, and Attila the Hun. Mephisto is an Event Hero and follows Event Hero rules. As a Demon, Mephisto has these Demon Synergies. As a Hell Lord, Mephisto has these Hell Lord Synergies. Last edited by Ronin; November 8th, 2017 at 09:33 PM. Start the game with 4 red Deal Markers on this card. When an opponent's Unique Hero that does not have the Valiant personality would be destroyed, if there is a Deal Marker on this card, you may roll the 20-sided die. If you roll 6 or higher, instead remove all Wound Markers from that Hero's card and place a Deal Marker from this card on that Hero's card. Androids, Constructs, and Undead are not affected by this special power. When Mephisto would receive one or more wounds, you may instead destroy a Hero with one of your Deal Markers on its card. Before placing Order Markers at the start of a round, you may choose a Hero with one of your Deal Markers on its card. Take control of the chosen Hero and that Hero's Army Card. For that round, before taking a turn with Mephisto, you may take a turn with the chosen Hero, adding 1 to the chosen Hero's Attack number. At the end of the round, destroy the chosen Hero. Last edited by Viegon; August 1st, 2016 at 10:28 AM. Nice to see darkraptor getting a design done now! 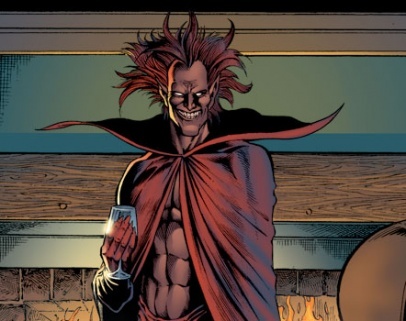 Mephisto looks really fun, but he seems to be under priced to me. I really like the design as-is, I think all it needs is some testing to determine whether or not the powers need tweaking. The design looks great to me. The only thing I'd suggest is maybe add a restriction saying that Deal with the Devil doesn't work on Wise figures, either? Also, pic 4 is by far my favorite. Maybe a subtraction to the roll, then? I think the 'collection' roll should be automatic. If he is bringing his enemies back to life so they can continue to attack him, and once he transfers wounds once the marker is removed, he should at least be able to force them to attack their friends at will while the deal is in place. I'd also consider having an option to pay the 'contract' anytime he takes wounds instead of only when he is killed. That way if he gets hit for 5W, but has 6 life left he can choose to transfer those 5W and remove a marker from the game. Otherwise he would have to take those 5W, dropping him down to 1 life remaining and would then be forced to break a contract for every 1W attack from then on out. Hey DR - if you make a simple post here you don't care about, I can give you back control over the SP by merging your post with SirG's. I'll read over the write up and give my thoughts in a bit here! I do know this one will definitely need some thorough and careful testing. I definitely like the idea of him being able to pay the contract just for wounds, not specifically when he would be destroyed. I believe that lets us trim text as well. I'm on the fence on the other suggestion, just because Puppet Master (albeit for many fewer points and with fewer restrictions) has shown just how nasty temporary mind control can be. And 6 is a really low roll. And he gets to do it before taking a turn currently (and he's no slouch on his own turn). So I'd be really reluctant to make that change. I could see him going up to 600ish if both changes were made, and maybe even without the auto temporary control (which I think I'm against at the moment). Start the game with three red Deal Markers on this card. 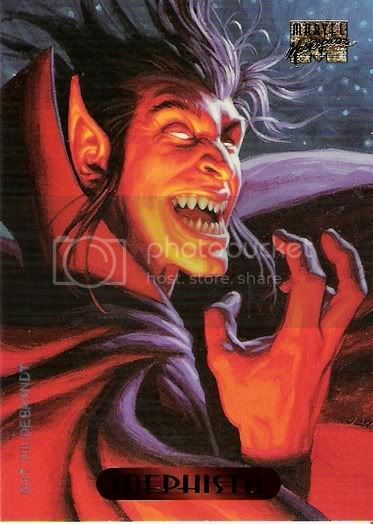 If an opponent's Unique Hero figure within clear sight of Mephisto that does not have the Valiant personality is destroyed, and there is at least one red Deal Marker on this card, you may choose the destroyed figure for a Deal. Roll the 20-sided die. If you roll 6 or higher, remove all Wound Markers from the chosen figure's Army Card and place that figure on any empty space in your opponent's start zone. After placing the chosen figure, place a red Deal Marker from this card on the chosen figure's Army Card. If Mephisto would receive one or more wounds, you may choose a Unique Hero with a red Deal Marker on its card, remove that Deal Marker from the game, and inflict the wounds on the chosen figure instead. 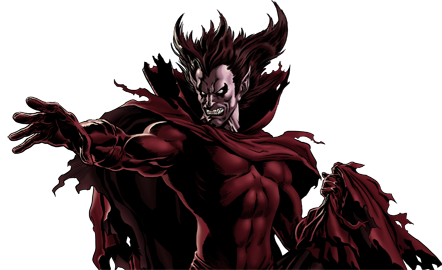 Before taking a turn with Mephisto, you may choose a Unique Hero with a red Deal Marker on its card and roll the 20-sided die. If you roll 6 or higher, take temporary control of the chosen figure and take an immediate turn with the chosen figure. At the end of that turn control of the chosen figure returns to the player that controlled the chosen figure before Time To Collect. All Order Markers that were on the figure's card will stay on the card.